It's perhaps a surprising turn of events but the latest Tom Cruise action vehicle, 'Edge Of Tomorrow' (★★★½) has been remarkably well received. Pitched as somewhere between 'Groundhog Day' and 'Aliens', it features Cruise as a PR forced into battle with an invading alien species before being killed - only to awaken and be forced to relive the battle again. And again. While 'Edge Of Tomorrow' has an undertone of playfulness, 'Fruitvale Station' (★★★★) has a much more bitter underlying sentiment. And arguably rightfully so. Ryan Coogler's powerful debut feature is based on the true story of an altercation at an American train station on New Year's Eve in 2009, starring Michael B Jordan. Having caught the film at Sundance London festival earlier this year, we certainly suggest going into the film with as little knowledge as possible. So much so I'm not even going to post a trailer for the film below. Instead, I'll point you to its awards - winning the Grand Jury Prize and Audience Award at Sundance Festival 2013, as well as Best First Film at Cannes 2013. Out now on DVD, 'Inside Llewyn Davies' (★★★★) sees the Coen Brothers reteam with 'O Brother, Where Art Thou?' composer T Bone Burnett to explore the semi-fictional struggle of a folk artist, played with aplomb by Oscar Isaac. The brilliant musical elements offer a vibrancy that contrast the inherent self-sabotage and coldheartness of 'Inside Llewyn Davis', which ultimately make this a bittersweet viewing experience. Also out on DVD is the twisting, weighty drama of 'August: Osage County' (★★★½), based on a play by Tracy Letts. A family reunite following the disappearance of one of their members, but their reunion is one rooted in conflict. The film may be slightly overwrought but Julia Roberts is well deserving of her Oscar nomination (albeit in the wrong category), while Meryl Streep also picked up an obligatory nod. Jordan FG returned for a new Telly Text column recently - taking in BBC Three series, 'Jonah From Tonga', which is the new series from 'Summer Heights High' creator/star Chris Lilley. He also takes a look at Netflix series, 'From Dusk Till Dawn', a TV adaptation of the Robert Rodriguez film. It may not be the biggest news of the week but as a fan of the film and subsequent TV show, Roland Emmerich revisiting his own 1994 'Stargate' film to create a new film trilogy is a pretty big deal. Even if it seems a tad unnecessary. On a sci-fi kick, we also have the news of Oscar winner Lupita Nyong'o and Gwendoline Christie ('Game Of Thrones') being cast in JJ Abrams' 'Star Wars: Episode VII'. Elsewhere in that cinematic universe, 'Chronicle' director Josh Trank has been snapped up to direct a separate film - watch his chaotic 2007 'Star Wars' short at Slashfilm. Continuing the sci-fi trend, The Wachowskis' latest effort 'Jupiter Ascending' has been pushed back to next year, despite being scheduled to appear in cinemas as soon as next month. 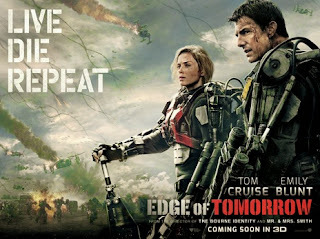 While the claim is that it's due to visual effects delays, I have an inkling it's also because it (sadly) looks a bit naff - although so did 'Edge Of Tomorrow', to be fair. In telly news, paranormal "reality TV" show 'Most Haunted' is set for a return, having been cancelled back in 2011. It'll be on a channel called Really. Really. Of course, that's probably only equally as ridiculous as Endemol (the producers behind the likes of 'Big Brother' and 'Deal Or No Deal') teaming up with an international space programme to try to film/fund a real "life on Mars".